Perhaps it was there before and I didn't notice it until now, but on Ran HaCohen's excellent website, which contains electronic versions of the Ge'ez Old and New Testaments, there is a copy of Dillmann's monumental Lexicon Linguae Aethiopicae. PDFs of this lexicon are available for download on the Internet but I've found the large PDF slow and difficult to navigate. Ran HaCohen's version is easier to navigate, with links to take you to each major section. 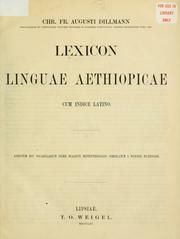 The Latin index is particularly nice if you're looking to back translate and find out what the Ethiopic word for something is. Of course Leslau's lexicons (the big one and the concise one) are my first resources, but sometimes it's helpful to consult Dillmann! Old stuff tool provided for us to know from where we belongs actually and also show a way forward through motivation to us to take initiatives in future through essay writing, so that world can renowned us too.